History and presentation : This 10-year-old male child presented with complaints of chronic episodic headache of 5-years duration. Initially, at the peak of his headache he had only weakness of the left upper limb, but as his symptoms progressed he also developed weakness of the left lower limb, with speech and visual disturbances, lasting for a few minutes, followed by complete recovery. Six months prior to his admission he experienced four such episodes per day, with each attack of ischemia lasting for half an hour, followed by complete recovery. There was no history of loss of consciousness, or tonic clonic movements suggestive of a seizure. He was started on anticonvulsants elsewhere. There was no contributory family history. On examination, the child was conscious, oriented with normal higher intellectual functions, with an intelligent quotient corresponding to his age. His fundi and cranial nerves functions were normal and he had no spinomotor or sensory deficits. His other systemic examination was normal. MRI and CT scan of the brain plain and contrast study showed multiple lacunar infarcts bilaterally [Figure 1]. MR angiogram of the brain showed bilateral stenosis of the ICA distal to the supraclinoid segment and in the posterior circulation [Figure 2]. Digital subtraction four-vessel angiography confirmed bilateral multiple stenosis of the supraclinoid portion of the ICA as well as stems of the ACA and MCAs and the posterior circulation with multiple collaterals arising proximal to the occluded vessels and from the external carotid artery [Figure 3]. Single photon emission computerized tomography (SPECT) images of the brain showed hypoperfusion in the right temporo-occipital area suggestive of an old infarct, with other areas in the brain parenchyma showing normal perfusion [Figure 4]. Adenosine brain SPECT study for evaluation of cerebrovascular reserve in stress and at rest showed a matched perfusion defect in the right temporo-occipital area, with no evidence of a new perfusion defect. Figure 1 :CT and MRI of the brain showing multiple lacunar infarcts bilaterally. 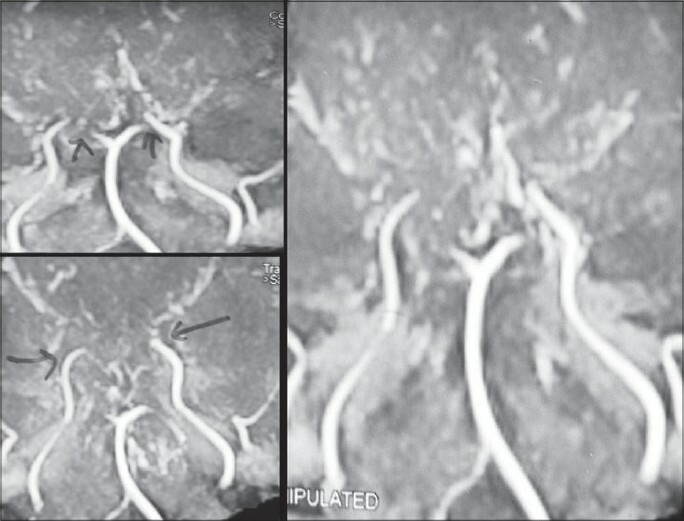 Figure 2 :MR angiogram of the brain showing bilateral stenosis of the supraclinoid segment of the internal carotid artery and posterior circulation with multiple collaterals. 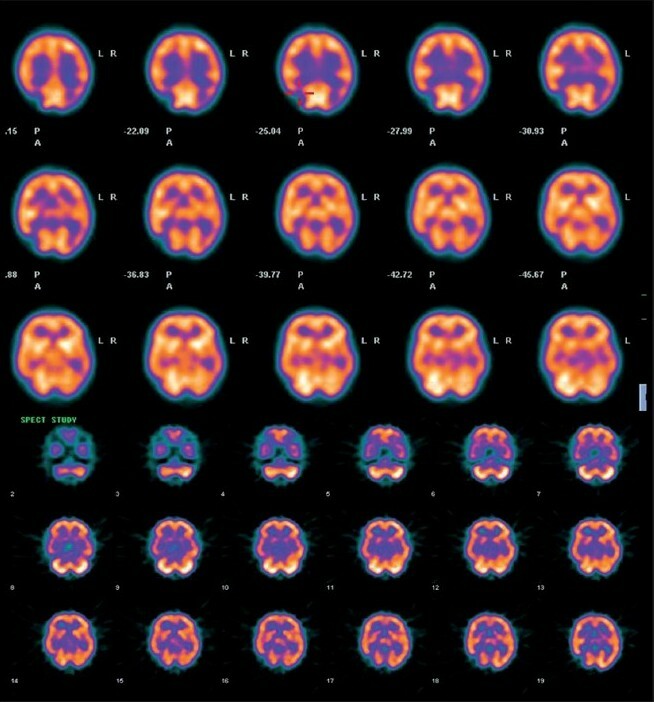 Figure 4 :SPECT images of the brain showing hypoperfusion in the right temporo-occipital area suggestive of an old infarct, with other areas in brain parenchyma showing normal perfusion. Under general anesthesia, with the patient in supine position, head kept neutral and flexed so that there is good exposure of the calvaria, a bicoronal skin flap was marked. The skin was infiltrated with saline solution in the subgaleal plane as this makes the dissection easier. The skip flap was turned taking care to preserve the galea aponeurotica and scalp blood supply. The periosteum was left attached to the bone, preserving the vessels as this will form the collateral network. Multiple triangular-shaped incisions were made in the periosteum and elevated as small flaps to expose the bone. Five burr holes were made on each side over the frontal, temporal and parietal region. The burr holes are made at each exposed area, using a high-speed drill, about 3 cm apart and 3 cm off the midline to prevent injury to the sagittal sinus. The surgical microscope is then used and the dura was opened through the burr holes, preserving the meningeal arteries. The arachnoid and the pia are then opened just enough to ensure a true opening without causing significant bleeding. Cautery was avoided to preserve the potential anastomotic vessels. The elevated periosteal flaps were laid over the exposed brain through the corresponding burr holes [Figure 5]. The galea was carefully replaced and the scalp was closed in two layers. A compressive head dressing was applied for 5 days. Postoperatively there was no cerebrospinal fluid (CSF) leak. The child is doing well and on 6-months follow-up had one episode of TIA. 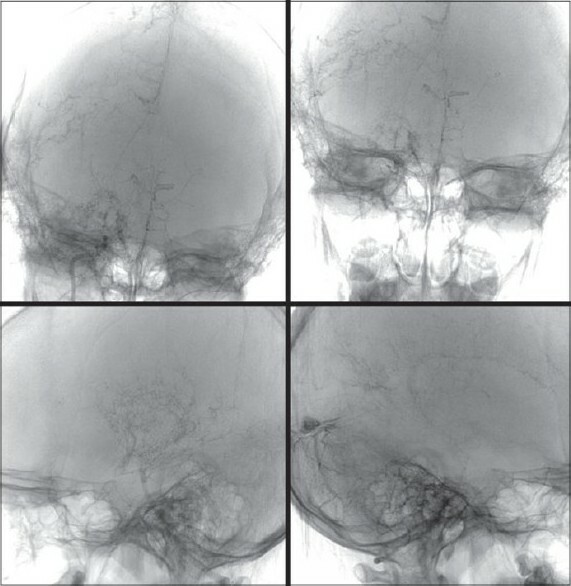 The postoperative effectiveness of the neovascularization was demonstrated 6 months later by four-vessel angiogram showing excellent cerebral revascularization around the burr hole sites [Figure 6] and SPECT imaging [Figure 7] showed hypoperfusion in the right temporo-occipital area suggestive of an old infarct. There were no other perfusion defects in the rest of the brain parenchyma. 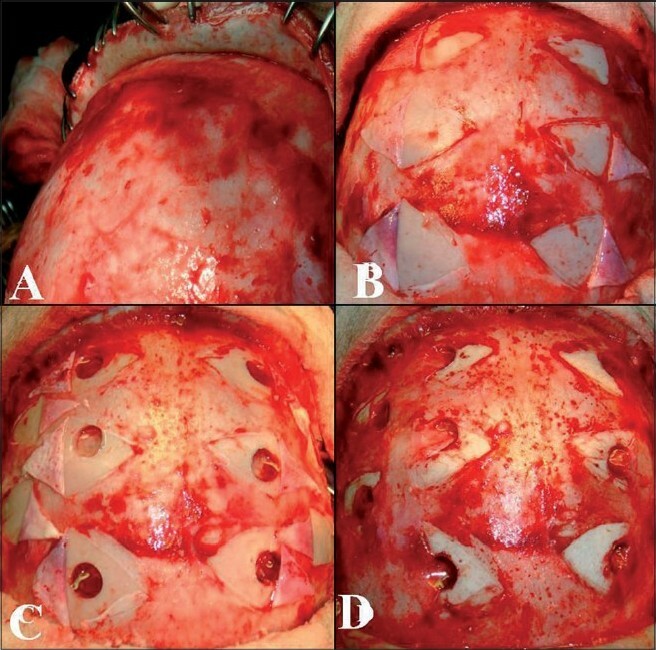 Figure 5 :Intraop pictures showing multiple burr holes drilled over the exposed areas of bone, through small incisions in the perisoteum a) scalp elevation, b) periosteal elevation, c) burr holes and dural opening and d) periosteal flap placed in direct contact with the brain. Figure 6 :Postoperative four-vessel angiogram done after 6 months showing excellent cerebral revascularization around the burr hole sites. 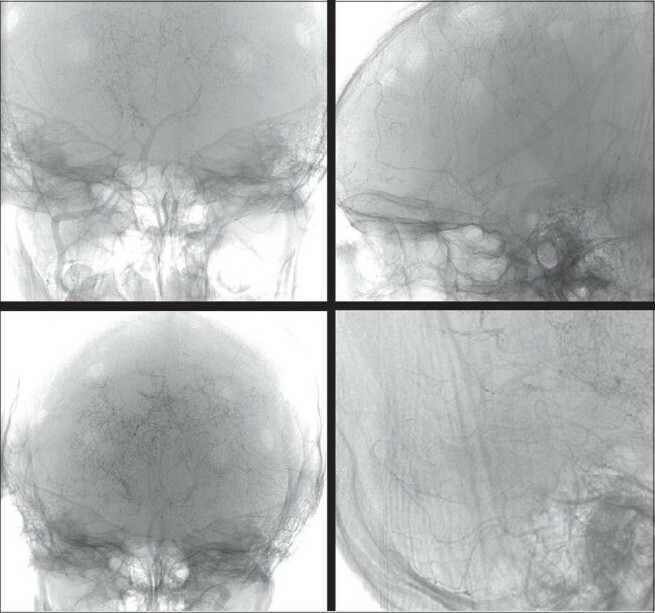 Figure 7 :Postoperative SPECT imaging showing hypoperfusion in the right temporo-occipital area suggestive of an old infarct. There is evidence of no other perfusion defects seen in the rest of the brain parenchyma. Endo et al., in 1989 demonstrated marked neovascularization across a frontal burr hole, which was used for external drainage of an intraventricular hemorrhage in a child with MMD. On the basis of this, they used additional frontal burr holes with EMS for treating children with MMD, and found better revascularization of the frontal area when compared to EMS alone. Kawaguchi et al,  performed the burr hole procedure alone in 1 adult and Sainte-Rose et al,  used the similar procedure of indirect revascularization in 14 children. They both demonstrated excellent revascularization without the necessity of a supplementary procedure. Based on the child's clinical and radiological findings we decided to do an indirect revascularization surgery, by making multiple burr holes and arachnoid openings over both cerebral hemispheres. Five burr holes were made in the frontotemporoparietal area of each hemisphere, as the child had symptoms of TIA, causing leg and hand weakness, with visual disturbances. The number of burr holes made depends on the site and extent of the disease. Sainte-Rose et al,  from their study have demonstrated an early improvement in cerebral perfusion following placement of multiple burr holes and use this technique in all patients with MMD. In children with MMD undergoing indirect revascularization techniques, or combined procedures, the extent of revascularization is dependent on the area and size of contact between the extracranial tissue and the brain, and Houkin et al, conclude that as much brain as possible be exposed and the external tissues be applied as widely as possible. STA-MCA and EMS procedures improve symptoms mostly related to the MCA territory. They did not improve symptoms of TIA with leg weakness, abnormal cognition, and visual field defects due to ischemia in the areas supplied mainly by the ACA and posterior cerebral artery. ,, Also, it is well known that MMD in children is dynamic and progressive,  thus deterioration of blood flow in the ACA territory can progress despite good collateral formation in the MCA territory. This technique described can be performed in a single stage, on both sides by using a bicoronal flap, where multiple burr holes can be placed over the whole hemisphere where necessary. The procedure is short and safe, with excellent revascularization of most of the cortex underlying the burr holes, and additional revascularization surgeries are not required. The duration is short-making it an option in high-risk cases. 1. Fukui M. Current state of study on moyamoya disease in Japan. Surg Neurol 1997;47:138-43. 2. Suzuki J, Takaku A. Cerebravascular "moyamoya" disease: Showing as normal net-like vesels in the base of the brain. Arch Neurol 1969;20:288-99. 3. Suzuki R, Kodama N. Moyamoya disease: A review. Stroke 1983;14:104-9. 4. Ueki K, Meyer FB, Mellinger JF. Moyamoya disease: The disorder and surgical treatment. Mayo Clin Proc 1994;69:749-57. 5. Imaizumi T, Hayashi K, Saito K, Osawa M, Fukuyama Y. Long- term outcomes of Pediatric moyamoya disease monitored to adulthood. Pediatr Neurol 1998;18:321-5. 6. Adelson PD, Scott RM. Pial synagiosis for moyamoya syndrome in children. Pediatr Neurosurg 1995;23:26-33. 7. Fujitha K, Tamaki N, Matsumoto S. Surgical treatment of moyamoya disease in children: Which is more effective procedure, EDAS or EMS? Childs Nerv Syst 1986;2:134-8. 8. Matsushima T, Fukui M, Kitamura K, Hasuo K, Kuwabara Y, Kurokawa T. Encephalo-duro-arterio-synangiosis in children with moyamoya disease. Acta Neurochir (Wien) 1990;104:96-102. 9. Matsushima T, Inoue TK, Suzuki SO, Inoue T, Ikezaki K, Fukui M, et al. Surgical techniques and the results of a fronto-temporo-parietal combined indirect bypass procedure for children with moyamoya disease: A comparison with the results of encephalo-duro arterio-synangiosis alone. Clin Neurol Neurosurg 1997;99:123-7. 10. Matsushima Y, Fukai N, Tanaka K, Tsuruoka S, Inaba Y, Aoyagi M, et al. A new surgical treatment of moyamoya disease in children: A preliminary report. Surg Neurol 1981;15:313-20. 11. Matsushima Y, Inaba Y. Moyamoya disease in children and its surgical treatment: Introduction of a new surgical procedure and its follow-up angiograms. Childs Brain 1984;11:155-70. 12. Endo M, Kawano N, Miyaska Y, Yada K. Cranial burr hole for revasularization in moyamoya disease. J Neurosurg 1989;71:180-5. 13. Houkin K, Kamiyama H, Takahashi A, Kuroda S, Abe H. Combined revascularization surgery for childhood moyamoya disease: STA-MCA and encephalo-duro-arterio-myosynangiosis. Childs Nerv Syst 1997;13:24-9. 14. Sakamoto T, Kawaguchi M, Kurehara K, Kitaguchi K, Furuya H, Karasawa J. Postoperative neurological deterioration following the revascularization surgery in children with moyamoya disease. J Neurosurg Anesthesiol 1998;10:37-41. 15. Iwama T, Hashimoto N, Miyake H, Yonekawa Y. Direct revascularization to the anterior cerebral artery territory in patients with moyamoya disease: Report of five cases. Neurosurgery 1998;42:1157-62. 16. Robertson RL, Burrows PE, Barnes PD, Robson CD, Poussaint TY, Scott RM. Angiographic changes after pial synangiosis in childhood moyamoya disease. AJNR Am J Neuroradiol 1997;18:837-45. 17. Kawaguchi T, Fujita S, Hosoda K, Shose Y, Hamano S, Iwakura M, et al. Multiple burr hole operation for adult moyamoya disease. J Neurosurg 1996;84:468-76. 18. Sainte-Rose C, Oliveira R, Puget S, Beni-Adani L, Boddaert N, Thorne J, et al. Multiple burr hole surgery for the treatment of moyamoya disease in children. J Neurosurg 2006;105:437-43. 19. Fukui M, Kano S, Sueiski K, Ilezaki K. Moyamoya disease. Neuropathology 2000;20:S61-4. 20. Maki Y, Enomoto T. Moyamoya disease. Childs Nerv Syst 1988;4:204-12. 21. Junichi M, Jun O, Takenori Y. Moyamoya disease. In: Barnett H, Mohr J, Bernett M, editors. Stroke: Pathophysiology, diagnosis and management. 3 rd edition. Edinburgh: Churchill Livingstone; 1998. p. 815-31. 22. Suzuki J, Takaku A, Kodama N, Sato S. An attempt to treat Cerebravascular "moyamoya" disease in children. Childs Brain 1975;1:193-206. 23. Mountz JM, Foster NL, Ackermann RJ, Bluemlein L, Petry NA, Kuhl DE. SPECT imaging of moyamoya disease using 99m Tc-HM-PAO: Comparison with computed tomography findings. J Comput Tomogr 1988;12:247-50. 24. Soricelli A, Postiglione A, Cuocolo A, De Chiara S, Ruocco A, Brunetti A, et al. Effect of adenosine on cerebral blood flow as evaluated by single-photon emission computed tomography in normal subjects and in patients with occlusive carotid disease a comparison with acetazolamide. Stroke 1995;26:1572-6. 25. Karyenbuhl H. The Moyamoya syndrome and the neurosurgeon. Surg Neurol 1975;4:353-60. 26. Houkin K, Ishikawa T, Yoshimoto T, Abe H. Direct and indirect revascularization for moyamoya disease: Surgical techniques and peri-operative complications. Clin Neurol Neurosurg 1997;99:142-5. 27. Ishikawa T, Houkin K, Kamiyama H, Abe H. Effects of surgical revascularization on outcome of patients with pediatric moyamoya disease. Stroke 1997;28:1170-3. 28. Burke GM, Burke AM, Sherma AK, Hurley MC, Batjer HH, Bendok BR. Moyamoya disease: A summary. Neurosurg Focus 2009;26:E11. 29. Malek AM, Connors S, Robertson RL, Folkman J, Scott RM. Elevation of cerebrospinal fluid levels of basic fibroblast growth factor in moyamoya and central nervous system disorders. Pediatr Neurosurg 1997;27:182-9. 30. Yoshimoto T, Houkin K, Takahashi A, Abe H. Evaluation of cytokines in cerebrospinal fluid from patients with moyamoya disease. Clin Neurol Neurosurg 1997;99:218-20. 31. Matsushima T, Inoue T, Suzuki SO, Fujii K, Fukui M, Hasuo K. Surgical treatment of moyamoya disease in pediatric patients-comparison between the results of indirect and direct revascularization procedures. Neurosurgery 1992;31:401-5. 32. Sakamoto H, Kitano S, Yasui T, Komiyama M, Nishikawa M, Iwai Y, et al. Direct extracranial-intracranial bypass for children with moyamoya disease. Clin Neurol Neurosurg 1997;99:128-33. Singla, A. and Lin, N. and Ho, A.L. and Scott, R.M. and Smith, E.R. 6 Observation of indirect neorevascularization after leptomeningeal biopsy in a 34-year-old woman with moyamoya syndrome - Should burr holes be considered as an alternative revascularization technique in younger adults with moyamoya? Purrucker, J.C. and Rohde, S. and Stampfl, S. and Ringleb, P.A.